Akumal is a small seaside village located on the Caribbean coast of Mexico, about 60 miles south of Cancun in an area call the Riviera Maya. The 2010 census showed a population of 1,310 inhabitants. Akumal is one of the best vacational beach resorts in the Riviera Maya, where you can get plenty of sun, relax or do water sports. Akumal has become a favorite tourist beach resort, as it has the most beautiful bays on the eastern coast of Quintana Roo State. If you are looking for the charm of the Caribbean at a slower pace of life, along with brilliant white beaches and excellent snorkeling and SCUBA diving, this is a great choice. Akumal is one of the best places to visit in the Mexican Caribbean for its great variety of beautiful beaches and tourist services. The Gran Bahía Príncipe Akumal (Great Prince Akumal Bay) and Half Moon Bay with its with fine white sandy beaches and the different shades of blue of the Caribbean sea will undoubtedly invite you to go swimming and snorkeling. As this beach resort is surrounded by incredible coral reef formations with underwater caves and canyons, scuba diving is another most attractive water sport. 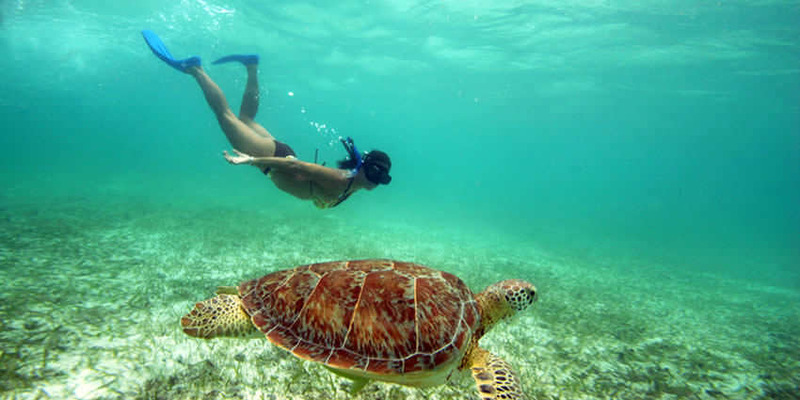 Akumal is famous as a destination for snorkeling, where visitors can swim with endangered green sea turtles, who visit the shallow bay to feed on sea grass. The popularity of snorkeling has put environmental pressure on the fragile habitat. The locals have developed a very high concern for ecological issues. They prefer that your sunscreen be biodegradable, and that you not touch the bottom over the eelgrass beds where the turtles feed. They have also roped off an area of the reef for free snorkeling with a buoy line. Although small, the area is more than adequate to see many turtles and some interesting spotted and regular rays. The name Akumal means “Place (land) of the Turtle”, due to the fact that sea turtles nest here each year from the end of April to October. These magnificent creatures can frequently be seen swimming in the shallow waters near Akumal. An important local organization, the Centro Ecologico Akumal, is dedicated to protecting these animals. The town of Akumal has a rich and fascinating history. Akumal was originally a seaport and trading center of the Maya. However, in the 16th-century a historic event occurred that had a lasting impact on the area. In the year 1513, a Spanish galleon shipwrecked off its coast. Seventeen sailors made it to shore and were promptly made slaves by the Maya. Only two of these sailors survived their ordeal, one of these men, Gonzalo Guerrero, married a Mayan princess. Their union created the first mestizos. Gonzalo so integrated himself with the Mayan people, he no longer considered himself a Spaniard. Today, a statue of Gonzalo Guerrero greets the visitor at the entrance to the town of Akumal. The town was officially founded in 1958 as a community for scuba divers by Pablo Bush Romero, a Mexican businessman, diver, writer, historian, and archaeologist. Pablo Bush’s family still owns a portion of Akumal, including the hotel Hotel Club Akumal Caribe. Akumal is also home to ONDARTE International Artist Residency. Akumal Mexico, in the Yucatan Peninsula, has been the sanctuary of the green turtles for hundreds of years. The sea turtles nest here each year from the end of April to October. The green turtles come ashore to lay their eggs, and they are protected as an endangered specie. These magnificent creatures can frequently be seen swimming in the shallow waters near Akumal. An important local organization, the Centro Ecologico Akumal, is dedicated to protecting these animals. The coral species and the endangered lion fish are also under akumal turtlesgovernment protection, and the Akumal Ecological Center (CEA) makes every effort in this respect as well. However, what makes Akumal charming and fascinating for tourists from around the world, is its spectacular bay with clear waters and underground rivers. Akumal is one of the most peaceful places in the Riviera Maya: one protected shallow bay with a secluded beach and a nearby reef. Akumal’s shallow bays are a popular destination for scuba divers and for those who enjoy snorkeling. The water is an incredibly brilliant turquoise blue color with fantastic clarity. The world’s second largest barrier reef occupies these waters and the abundance of sea life is amazing. There are over 500 species of fish and 4 different species of sea turtles that can be seen here. For those who prefer fresh water, there are a number of cenotes (sinkholes) that provide entrance to underlying cave systems, offering the cave diver fantastic opportunities for exploring. Adventures on land include exploring the surrounding jungle where hidden caves can be explored and where exotic flora and fauna can be seen. Deep-sea fishing is an active sport in these waters as well; the promise of a day’s catch might include Mahi Mahi, Kingfish, Marlin or Sail Fish. Sections of the reef and the main feeding ground of the sea turtles are completely closed to the public due to severe overcrowding by humans and the resulting spread of diseases in the turtle population. This is enforced by federal military. 1. Go on a tour provided by one of the two great dive shops in town. It is $40 USD per person. 2. Go on an “unofficial” tour. If you stand on the beach with a clueless look on your face, a local may approach you and offer to take you snorkeling on his glass-bottomed boat. It is usually $20 USD per person and includes snorkeling equipment. The guide will attempt to find the famous sea turtles for you and show you different corals and fish. Make sure you are comfortable swimming with flippers as the guide may swim quickly from site to site. Not always legal business’, hence the deals. 3. Rent or buy your own equipment and swim out alone. The coral reefs are not too far from the shore and can be easily accessed by swimming, especially with the help of a life preserver. Much of the bay is not more than five feet deep. Be very careful to stay away from the “fire reef” marked with buoys and a distinctive red colored coral. It stings and excessive contact can be fatal. There are sea turtles living in the bay that visitors will see while snorkling, enjoy this incredible experience. Since coral dies on human contact, you should avoid touching coral at all costs. It is also illegal to touch the wildlife, such as the sea turtles, so please do not try to ride them or bother them in any way. Ecological Center (Centro Ecológico Akumal or CEA) at the end of Akumal bay to learn more about the area’s ecosystems, species and local environmental events. Although many tourists come to visit, the beach resort never seems crowded and remains as an ideal vacation destination. One of the finest places to go swimming and snorkeling in addition to the main bay and half moon bay is the Yal ku lagoon about 2km north of the town, where you will find a sweet water well among the rocks and many colorful tropical fish. Not far away from Akumal town to the west you will get to the cenote “Azul” and cenote “Eden” and may more, where you can also enjoy swimming, snorkeling and cavern diving in a vast cavern area. Some 4 km to the south you reach the extensive natural park Aktun Chen with spider monkeys, white tail deer, iguanas, wild pigs and tropical bird species. The park also contains a huge cave of three galleries with stalagmite and stalactite formations, and in the main gallery you will discover a beautiful cenote. Among other famous cave systems with cenotes worthwhile visiting is Kantuchi within the same area known as the Maya Zone or Felipe Carrillo Puerto Zone. The zone called Rio Secreto also contains huge caverns with cenotes everywhere, and all of them are very close to Akumal. About 6 km south of Akumal you will reach the beautiful beach Xcacel, and in walking distance you will reach a cenote with clean cool water. Xcacel is the protected natural reserve, where the green turtles come to the beach during the night in the nesting season, where you will be able to observe them. This is certainly an amazing experience for kids and grown ups alike. By bus from Tulum: $1-$3 (0:25 min). By bus from Chetumal (via Felipe Carrillo Puerto): $12-$17 (3:30/4:00 hours). By bus from Cancun: $4-$6 (1:50/2:10 hours). By bus from Playa del Carmen: $1-$2 (0:35 min). “Colectivos” or taxi from Tulum or Playa del Carmen.